I received an email from a Discover Circuits visitor. He wanted to control power to a LED camping light he was building. He wanted to turn the light on and off with a small pushbutton switch. He also wanted a timer so the light would not stay on longer than 30 minutes at a time. It seems that his kids often turned lights on when going to bed and then forgot to turn them off. from Cree but drive it with 500ma for a power of only 1.5 watts. He figured that the batteries would give him about 20 hours of illumination before being replaced, if his kids didn’t sleep with the thing on, thus the need for the 30 minute timer. The circuit I came up with is shown below. 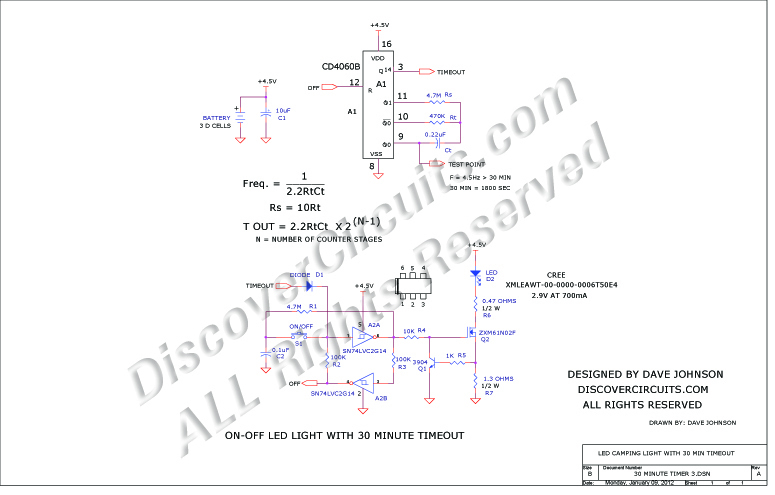 A CD4060 is used for the 30 minute timer. The device has an on-board oscillator and a 14 stage binary counter. With the components shown the counter completes a half cycle at the Q14 output in about 1800 seconds. Transistors Q1 and Q2 form a classic constant current LED driver. The resistor R7 controls the current Amplitude. I inserted an additional resistor R6, so the power dissipated in the transistor Q2 was lower. A2a and A2b schmitt trigger inverters form a latching circuit. With each activation of the pushbutton, the circuit either latches the LED on or latches it off. In the on mode, the counter circuit is allowed to begin counting pulses from the clock oscillator. After 8192 pulses the output at pin 3 of A1 swings high. This forces the latch circuit to turn off, which turns off the LED and holds the counter in reset.